In late 2007, I was drawing money out of a Kyoto cashpoint at 240 yen to the pound. In the time since then, the relative value of the pound to the yen has fallen a terrifying 40%. What this means, for you and me, is that anything Japanese is 40% dearer. A CD that once cost you £20 is now more like £28. A tenner’s sushi is now four quid more. Obviously, these issues trouble you a lot more if you are spending large amounts of money. One pound on the cover price of the magazines I read each month for NEO’s Manga Snapshot isn’t going to make that big a difference to me. But if you’re an anime distributor, used to writing cheques for six-figure sums, you’re going to feel the pinch. If you’re mastering or duplicating your DVDs in, say, Poland, you’ll be paying more in Euros for what used to be a cheaper option. But it’s an ill wind that blows nobody any good, as a bunch of amateur economists recently realised. In late January 2009, as the sterling exchange rate sank to a shameful 128 yen, a blogger in Japan began posting his musings on grey imports. Blimey, he said, I can buy Monty Python for a fraction of the Japanese price, and have it sent to me from the UK. Come to think of it, I can buy a LAPTOP, too. A different plug on the cable, and I’m laughing! Initially, activity was timid. A few early adopters broke out their credit cards to see how it might work out. When one of them posted a happy photograph of the battered but solid Amazon UK parcel on his Tokyo doorstep, the floodgates opened. The first I heard about it was a day later, when a worried anime distributor called to pick my brains. UK online sales of one of his company’s titles, which we shall have to call Schoolgirl Milky Crisis, had suddenly, dramatically spiked. Initial elation turned to concern – why was he suddenly rushing to meet orders so much larger than usual? It turned out that the orders were mainly going abroad, and that’s when he asked me to dig around on the Internet. It took less than a minute for me to track down the anime speculators and their excited bloggery. Which only made matters worse, because if I could do it, so could the Japanese licence holder. Many Japanese companies are utterly petrified of this sort of thing. You wish your anime were cheaper? They wish it were more expensive, because grey imports give them nightmares. It was only a few months ago, in this very column, that I was discussing the symptoms of Blu-Ray Blues, whereby a company tries to centralise and standardise all editions of a release into a single Japan-made disc. But if that super-master-disc, containing all language versions, is 40% cheaper abroad than it is in Japan, it would play havoc with a company’s Japan-based statistics, economics and decision-making. Domestic sales will always come first for the Japanese, as foreign money, in these credit-crunchy times, is back to being just gravy. This, in turn, will present accountants in a Tokyo office with a sudden desire to force distributors in the UK to raise their prices to discourage Japanese grey-import opportunists! Of course, if the pound goes up any time soon, everyone will probably just forget about it and chalk it up to economics. What are the chances of that…? 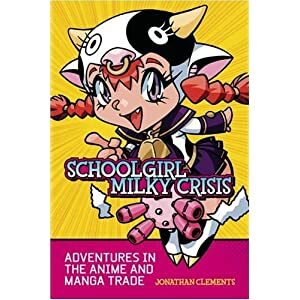 Jonathan Clements is the author of Schoolgirl Milky Crisis: Adventures in the Anime and Manga Trade. This article first appeared in NEO #65, 2009.